There has been a “Fight for 15” movement the past few years to increase minimum wage. Making a counter move, McDonald’s unveils self-service kiosks. The fight for $15 minimum wage has really stepped up recently. They argue that people should not work 40 hours and not make enough money to survive. It will be interesting to see whether or not more companies take steps like this to combat the increased wages for employees. Those against the $15 minimum wage counter that this is a starting job, not a career. 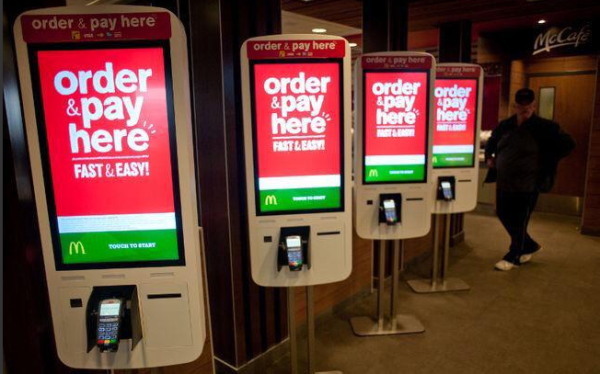 Since McDonald’s unveils self-service kiosks, it will be interesting to see if this starts a chain reaction with major corporations starting similar moves. because Macdonalds Needs to Hire Computer Technicians and Those jobs pay More. Which means McDonald’s will pay more in labor. Don’t be scare to loose cashier jobs!! Get train and transition to a better job. Feel sorry for the cooks tho.